When placing your bets regardless if it’s online or at the track the first thing you want to look for is the horse’s statistics. At the track you will want to get a hold of that day’s Race Program. They have a lot of important information that you will want to know. What’s in the Race Program? The race program lists the races for the day, sometimes for multiple tracks if satellite wagering is available. These pages list the horse’s statistics, the horse’s racing history, the details on the specific race including length, weight requirements, as well as the accepted bet types and the purse for that race. All this vital information is present, but many times the track will include special information such as upcoming events, history, or other articles of interest to bettors. Many programs also include a map of the facilities, and most importantly, a key to understanding the Race Program. 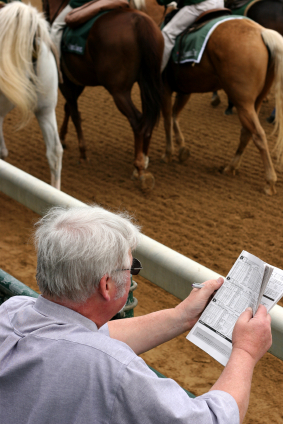 There is quite a lot of information that bettors are interested in when deciding on which horse to wager. If all of this information was written out in sentence format, every Race Program would be as large as a phonebook! This would deter many people and would use a lot of paper every race day. To make things simpler the tracks create very small listings for each horse in each race with tightly compacted data and abbreviations. It is very important to remember that these may change from track to track, so it is always a good idea to look at the key in the Racing Program. However, once you are familiar with the typical abbreviations and information on the program it becomes very easy to understand all programs. At the top of every page there will be information on the race itself. If your racetrack participates in satellite betting the different racetracks will have their races in different sections. Be sure you know which racetrack you are betting on. Also at the top of the page will be the race number, the distance, whether it is a dirt or turf race, as well as restrictions on the horses. For example, it may say that it is 1 ½ mile dirt race for 3 year old fillies. This is also where you will find what exotic bets will be accepted. These do change from time to time and it is important to know before approaching the betting window. Below all of this in rows will be the details for each horse registered to run in that race. The most important information for horse race betting is in large, bold letters. The horse’s program number and name will be the largest information in their entry. The program number is the number you will tell the teller when you place your bets. Below this number is the saddle cloth color and the post position, which will help you pick out your horse to cheer on. Below the horse’s name will be listed the Jockey’s name and the colors of the Jockey’s silks. In large bold letters on the right will be the odds as determined by the handicapper before any bets are laid. With parimutuel betting these are subject to great change before the race actually begins, however they are a good starting point. Once you are comfortable getting just the basics out of the program it will become easier to decipher the race history and other information packed into the program. Depending on your preferences and betting strategy, there is plenty of information for all bettors to utilize. The owner, trainer, bloodlines, any medications, training history, and even performances in past races are listed as well as the track conditions.